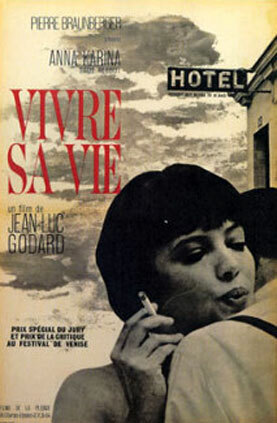 Jean-Luc Godard was one of the ring-leaders of the French New Wave film movement, experimenting with the form and capturing the essence of day to day life for his Parisian contemporaries to smoke packets of Gitannes over. In his third film, Vivre Sa Vie, he trained his gaze on his own wife, the gorgeous Anna Karina, who stars as Nana, a 22 year old woman who leaves behind her husband and child to pursue a career as an actress. She wants a taste of something more, some excitement, some sense of herself. What she ends up getting, however, is the so called ‘protection’ of a pimp and the dodgy life of a prostitute. Told in twelve distinct chapters, the film chartered brave new territory at the time; our first encounter with the protagonist, for instance, is with the back of her head. It’s a bold choice but it serves to put the viewer in the picture as something of an eavesdropper. As the chapters unfold, we get to know Nana better and revel in her wayward beauty. When she pops a coin in the juke box and erupts into a free-spirited dance around a pool hall, it’s hard not to adore her. As a result, we’re sucked into the full force of her tragedy. Using a poignant excerpt from the 1928 Carl Dreyer film, The Passion of Joan of Arc, Godard aligns the fate of his heroine with that of the famous French Saint; Nana watches the movie screen transfixed with tears of empathy streaming down her face. Real life philosopher Brice Parain tries to explain to Nana the illusive interplay between one’s inner life and one’s social interaction. It’s a tricky, kind of existential concept for her to grasp but like the film, it’s French to the bone. So are shots of the Champs Elysee, where Nana walks the streets past peeling bill posters and smoky bars. It’s enough to make art directors go fully weak at the knees. Feminist author Susan Sontag claimed that it was ‘one of the most extraordinary, beautiful and original works of art’ that she knew of. It may be languid in parts but it lays on riches with images and ideas that linger long after its shocking dénouement.